Camping is a barrel of laughs. Unless you’re sitting and lying around on bumpy ground all day. In that case it’s a barrel of bruises. Make yourself a little comfortable with a camping cot. They are a small price to pay for increased comfort, so they are a great investment! If you are looking for a king size camping cot that gives you a comfortable camping experience, then you should consider this one. Measuring over 85 inches long and 45 inches wide, combined with a weight capacity of 600 lbs, it can comfortably accommodate two people. Is there a better way to share heat when camping? You might be thinking that such a large cot would require a whole scout troop to carry due to weight. Well, you are definitely wrong. Despite its large size, this XXL camping cot is lightweight and portable, making it easy for one person to carry. What makes this cot so unique? There are a number of features guaranteed to make your camping experience a memorable one. They include a solid construction that features aluminum frames, steel legs and heavy-duty canvas top. Such a combination of materials is designed to give you a camping cot that will last you ages. This one requires just one individual to set up. After you are done with your camping, it folds easily. If you are the size of Paul Banyan and you need a camping cot that will fully support you, this is the one. With a ground clearance of 19 inches, this is a good option for those who hate sleeping on the ground. Portability is one of the greatest benefits of this cot, despite being large. When it is folded, it only weighs 26 lbs and slightly larger than majority of the smaller cots on the market. It can easily fit into the trunk of your car, making your camping trips easier and packable. What are you still waiting for? Grab this cot and luxuriate in the wild! Coleman is a reputable brand, when it comes to sports and outdoor gear. This camping cot with spring coil suspension is designed to provide you with the best of what camping has to offer. Forget the lion, you will feel like the king of the jungle, when sleeping on this cot. Weighing only 14 lbs when folded, it is one of the lightest camping cots. You might feel like the price is quite high for a camping cot. However, this one offers value for money. There is no need of purchasing a flimsy cot that will break down on your first camping night. This cot comes with excellent features and benefits, which makes it very functional. It offers superior comfort, thanks to its spring coil suspension alongside the heavily padded thick foam mattress. This is one is also durable, when you consider that it features heavy duty steel design and construction. This sturdy camping bed can support a maximum weight of 275 pounds. This means that it can accommodate two adults, or an adult, a kid and a dog comfortably. Anyone below 5 fit and 7 inches tall can sleep inside this camping bed. With the Bi-fold frame, this one is easy to assemble and disassemble. On the other hand, the leg design makes sure that the cot remains stable on the ground. It can also endure different pressures, regardless of the ground terrain. This compactly designed cot easily folds up, and can fit inside the trunk of your car, while still leaving enough space for other camping gear. With a 1 year limited manufacturer warranty, you get a strong, durable, and comfortable camping bed for all your outdoor needs. Give yourself an amazing sleeping space during your outdoor moments, with the Coleman Comfortsmart Deluxe Cot. If you need a sturdy, spacious and comfortable camping bed, this is definitely the one. This camping cot with mattress features thick foam, as well as in-built spring coil suspension system. The spring coil suspension system gives you a feeling of luxury and lets you relax after a long hiking day. Moreover, the mattress itself is made of thick foam. All these features ensure that you create a home away from home. Have you ever slept on a spring coil suspension camping bed that produced so much noise whenever you turn and toss? So much noise that you couldn’t sleep? Well, you don’t have to endure that any longer, thanks to the Coleman Comfortsmart Deluxe Cot. Deluxe is a name associated with powerful and reputable brands, and this deluxe camping cot, lives up to those expectations. It is slightly larger than your average camping bed. This is just perfect if you want your canine friend to accompany you during your camping trip. He does not have to worry where he will sleep, since the cot has enough space. Talking about the materials and construction, no one wants a hurriedly or a poorly built cot. The materials used in making this one guarantee to withstand the test of time. The frame metal itself is built using durable steel, which can support a weight of up to 300 lbs. Apart from the steel frame, the quality of the mattress is gives you a better reason, why you should invest in this one. This one will retain its shape, regardless of the number of camping trips you take in a year. Setting up is effortless which you can do alone. Comfortable sleep is part of enjoying the great outdoors. After engaging in various activities during the day, you need somewhere comfortable and luxurious. Teton Sports has already taken care of that with this camping mattress. So, what sets this one apart? To start with, it comes with an integrated pillow pocket. This feature helps to raise your pillow off the ground. On the other hand, the innovative roll assister ensures that you can roll the pad tightly, for easy storage. Created using thick open-cell polyurethane foam, this camping mattress will retain its loft and shape, regardless of the number of times that you roll it up. This dynamic and beautifully designed cot is easy to use. You don’t have to be a seasoned outdoorsman to know how to set this up. Since it is available in 3 distinct sizes, it can accommodate almost all body types. The outer is made of brushed canvas, which makes it very easy to clean. Teton Sports designed this one just for you. It comes with a Velcro storage pocket, which can be used to store your keys, small flashlight or phone, for easy access during the night. This versatile camping pad can be used alone as a ground pad with a cot. Alternatively, you can use it as an extra bed for guests at home. If you are looking for one of the best camping cots, then you this one is worth your money. Do you fear camping just because sleeping at night is a nightmare? Chances are, you always sleep on the ground whenever you go camping. Well, that was great when you were 10 to 12 years. However, as you age, you need something comfortable. Your solution is the Kamp-Rite Double Kwik Cot. Whether you are planning to sleep alone or share your cot with someone special, this one can take care of all that. It can support a maximum weight capacity of around 500 lbs, making it perfect for those who want to share a sleeping cot. It is easy to set up and use. In fact, it is so large that you can use a queen-sized air mattress on it. One of the best features of this camping cot with adjustable legs, is the patented folding system. A sturdy and heavy-duty steel frame supports the system itself. Designed to provide superior comfort, this one comes with a storage bag. It is one of the most popular sleeping cots on Amazon, and it is clear to see why. Designed and built to last, the Kamp-Rite Double Kwik Cot is one of the double-sized cots available on the market today. Apart from the patented folding system, other specifications include heavy-gauge nylon fabric, heavy-duty steel frames, a storage bag and a maximum weight of 36 lbs when folded. The days of having to lash two cots together are long gone, thanks to this comfortable and portable camping bed. This simple and lightweight camping bed is enough for most campers, who are looking for something affordable. It provides a good deal for a very affordable cost. It is durable, easy to clean and easy to assemble and disassemble. Setting up a camping bed should not take more than thirty minutes. This one is 8 inches from the ground. Therefore, any insects or small mammals will not affect your sleep when you are camping. Moreover, the space beneath the ground can be used to store smaller items like sleeping bags, cot cover and a sleeping pad cover. When sleeping on some other cots, you tend to feel the crossbars pressing against your body. However, you don’t have to endure that uncomfortable sleeping any more. This one has been constructed in a way that the sleeping bars don’t touch the canvas. Therefore, you get a peaceful night’s sleep, and even forget you are out in the wild. Once you are done with the camping, the cot fold up easily and fits into the carrying case. Legs are constructed using stainless steel. Therefore, as long as you don’t exceed the maximum weight carrying capacity, your cot will never break apart or drop you on the ground. This is one of the best camping cots available on the market. It specializes in providing a greater degree of durability and comfort, through its durability and size. This one makes you feel as if you own the world. You might be asking yourself why you should buy this one, and not the others. For starters, it features a zipped carry bag for easy carrying, heavy-duty steel frame construction, good for tall people, can support up to 400 lbs, firm and sturdy on the ground and it does not make noise during sleep. At 84 inches long, the Kamp-Rite Oversize Kwik Cot remains one of the largest camping cots, for those who love spending time outdoors. It also features two pouches that provide a safety haven for your personal items as you enjoy your sleep at night. After sleeping, you just fold up the cot while the two pouches become carrying handles. This camping bed is easy to open and fold. In fact, it is something that you can do within seconds or a minute at most. While most oversized cots can be grueling to set up, this one makes the whole process effortless. You don’t have to sleep tired as a result of setting up a cot. The truth is, there are various camping cots on the market today. However, very few provide as much space and room as this one. Lift yourself off the ground and enjoy your sleep at night with this comfortable and durable Kamp-Rite Oversize Kwik Cot. Of course you love your kids and then you love camping. What happens when you have a toddler and you want to go camping? Where will they sleep? Your child should not sleep on the hard ground. On other hand, bringing their crib is not even an option. Before you start feeling helpless, there is a ready solution for that. This toddler camping cot gives you an opportunity to let your kid experience nature, without worrying about their sleeping arrangements. This lightweight and small toddler camping cot is also durable, flexible and portable. In simple terms, you can easily carry it from one place to the other. On top of that, setting it up is a breeze. You are done even before your toddler can realize it. The use of sturdy steel frames ensures that your kids remain safe and protected. Another reason why you should trust this product, is that it meets the strict regulations set by Juvenile Products Manufacturers Association. This camping cot for 2 year old will give you the freedom and luxury of enjoying the great outdoors with your kids. The cot is feather-light. In fact, you can carry it on one hand, while you hold the baby with the other hand. It also offers value for money. You get a comfortable and durable camping cot, which will give your toddler a peaceful night’s sleep, anytime you are camping. The Regalo My Cot Deluxe is a lightweight and easy to set up camping bed, which also comes with a sleeping bag. It is ideal for those who intend to go camping with their kids. Sleeping on a cot during cold weather is always a pleasure. The problem is, very few cots are versatile and flexible, to be used on both hot and cold weather conditions. However, with the Kamp-Rite Oversize Tent Cot, you can have this enjoyment. It combines the utility of a cot and a tent, lifting you off the ground while providing you with adequate protection against the elements. It comes with 3 main benefits, all combined into one. First, this one is easy to set up. It will not eat up into your camping time. Secondly, it lifts you off the ground, away from the cold surface, the rocks, the sticks and the crawling mammals. The third benefit is that it will protect you against the elements. Another notable thing is that its side walls are almost vertical giving you extra space inside. Similar to a tent, this one comes with double entry mesh doors, allowing easy access together with some degree of cross-ventilation. This camping bed also features a rain fly that provides protection against bad weather. It also comes with a roller wheel as well as a carry bag, providing you with various options when you want to move it from one location to the other. When it comes to construction this one features aluminum frames and heavy-duty tent material. Weighing only 18 lbs, it is one of the lightest camping cots on the market. Whether you intend to camp during the hot or cold weather, this one provides you with enough options and features, to ensure you enjoy vivid moments out there. If you are a budget-conscious hiker or mountaineer, you just need a bed that can offer comfortable sleep at night. Nothing fancy. With that reason in mind, you don’t need to spend the day hiking with a heavy and big bed on your back. You need a light and compact folding bed. The Trademark Innovations Portable Folding Camping Bed precisely fits that description. It is preferred by many hikers and campers due to its affordability and practicality. It measures approximately 75 inches long, 25 inches long, and 17 inches high. The space beneath can be used to store your hiking gear and other hiking assortments. This camping cot is made of lightweight and well-finished aluminum, to provide you with years of reliable comfort and service. It comes with a portable design, allowing you to move it from one camping spot to the other, without spending too much energy and effort. Whenever you are camping, you don’t have to sleep on poorly padded beds any longer. Buy the Trademark Innovations Portable Folding Camping Bed and comfort will accompany you even in the most challenging outdoor environments. In a nutshell, this is a good choice for anyone, regardless of their camping experience. It is easy to assemble, affordable, sturdy and most importantly: comfortable. This folding cot by Byer Maine comes with the feel and look of a real bed. It is easy to set up and store and remarkably easy to use. You can set up the entire cot within a single minute, and you won’t leave behind any loose parts. It features welded steel legs. Therefore, you are guaranteed maximum safety and protection, throughout the night. This one is wide and very long, which allows it to accommodate even taller campers. The frame is designed in such a way that it provides the necessary support, in all the needed areas. It is very comfortable and sturdy, since it is designed to conform to the curves of your body. You can use it as an extra bed at home, especially for accommodating your guests. Also included is a polyester carry bag that provides an easy means of carrying. It tends to be heavier than other cots in the same category. However, that is just an indication of the quality of materials used during construction. Unlike other flimsy cots that break apart after a few months of use, this one will hold up for many years, giving you the support and comfort you need. The KampRite Double TentCot is a remarkable and versatile tent cot, which is easy to transform from a tent straight to a camping lounge. This one is easy to set up and provides you with a restful sleep at night. It comes with two zippered polyester as well as cross-section passages, which provide simple access in and out of the cot. If you have been camping for a while, then you sleeping on a camping cot inside a spacious tent is much comfortable as compared to sleeping on the ground. Now, with this double size tent cot from KampRite you can combine both luxuries. This is an enclosed and fully framed cot, featuring nylon sides together with mesh doors and windows. It has a ground clearance of 11 inches. This provides you with enough buffer zone against snakes, moistures and rodents. In short, you don’t have to wake up with a rodent gnawing on your nails thinking it’s corn! Most importantly, this camping cot is comfortable and roomy. It has enough space to allow two adults to stretch out completely and enjoy comfortable sleep at night. This double version is even larger than a queen-sized bed and provides plenty of headroom due to the styling of the dome. The construction of this tent cot features lightweight and durable aluminum, enhanced with anti-vibration aluminum nuts and bolts. 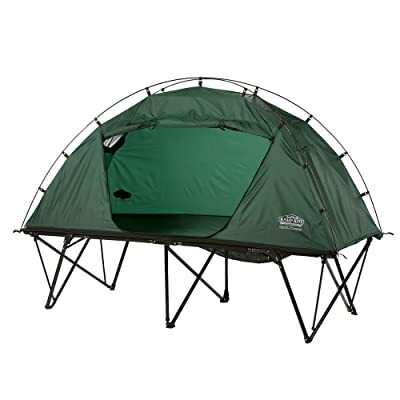 The tent itself is made of 420-denier nylon fabric. This is one of the newest camping cots from this brand. It features steel legs and aluminum frames, while the sleeping area is reinforced with water-resistant polyester fabric. This construction makes it rust resistant and strong. This Vivo Cot is also one of the best camping cots today. This aluminum cot is perfect for travelling, camping or simply lounging. If you want to relax, then this is the cot for you. It measures 25 inches wide, 75 inches long, as well as 18 inches high above the ground. It can support a maximum weight of up to 250 pounds while the set up process is hassle free and effortless. It also comes with a carrying bag. This comfortable camping cot is perfect for both outdoor and indoor use when you consider its sturdy aluminum frame together with its rubber-tipped steel legs. This allows the cot to be more lightweight, portable and comfortable. It comes with a green color making it easy to blend in with common natural surroundings. Its carrying bag also comes with a shoulder strap, which adds to the carrying convenience. You don’t require any special skills or tools to set it up. This makes it great for everyone who enjoys the outdoors, whether you are a scout or a camper. You can finally camp in luxury and comfort, thanks to this VIVO Cot. This versatile and heavy-duty cot will ensure that you enjoy your sleeping during your camping adventures. It features a strong frame, together with a polyester surface, which is water resistant. The frames are made of heavy-duty steel, which endures repeated use thus giving you dependable service for many years to come. It is also designed with a hook and loop wrap, which secures the cover easily for quick setup. When it comes to storage and portability, it simply rolls into a convenient carry bag. This one is comfortable and large. You can turn and toss all the way you want, and you won’t slip out and hit the floor. More importantly, it does not produce those creaky noises that can be very annoying at night. The construction is also sturdy that makes sure that it does not move from side to side. The 20 inches off the ground provides you with enough space for storing your hiking gear such as clothes. This feature saves some space inside your tent. The material around the aluminum frames is reinforced to provide additional strength. You can also adjust the firmness of the cot, using the Velcro strapping, which is quite a unique feature. Due to the strength and sturdiness of the materials used, it is quite heavy. It is therefore ideal for campers and not backpackers. When setting up this cot, ensure that you first install the short bar. Compact and convenient, this cot is your perfect camping companion. Designed and built to last, this one is so comfortable and stylish. You might be tempted to do away with your conventional bed at home, and use this one. It doesn’t make those annoying creaky noises at night, when you turn. It is easy to put up and disassemble. Not like those complicated models that take an eternity to set up. Once you take it down, you simply tuck it inside its carry bag. Beneath the cot, there is a storage bag. You can use this pouch to slip in a flash light or some other valuables at night, for quick access. Designed to provide superior comfort, this one is easy to use. Even your 11 year old can set it up without any help. This cot comes with a sturdy aluminum frame, which can collapse down to an easy-to-store, easy-to-handle size. Extra features include mesh storage hammock, a padded head section, and a washable denier cot base. When you combine the outdoor serenity with a comfortable night’s sleep, camping becomes even more fun. When you mention sleeping on cots, some people recall sleepless nights while others only remember waking up with aching backs. Thanks to the Disc-O-Bed Cam-O-Bunk cot, those bad sleeping memories are over. The beige steel frame, combined with the green canvas gives this cot a workhorse appearance. Some of the key features that come with this cot include aluminum frames, patented assembly system, maximum carrying capacity of 500 lbs, and unfolded dimensions of 8? x 28? x 36.6?. The bottom provides some space for storing your camping gear. What makes this one great is the fact that you can easily convert it into a couch. When you first see the bag of parts, you immediately think that it is going to be a daunting task to set it up. However, with the patented no-tool assembly design, putting this cot up is as easy as it gets. You only need 10 minutes for the entire procedure, and you can have the remaining time to explore your new surroundings. This one is so comfortable that you can sleep in it for multiple nights. Imagine the comfort and luxury of sleeping in those soft, velvety beds found in 5-star hotels. Well, you don’t even have to imagine any longer. Just get this camping cot, and sleep yourself away to luxury. You deserve it. This cot can be used as two separate beds. Each cot has a weight capacity of around 500 pounds. It also comes with a heavy duty carrying cot, just to ensure that the whole package gives you the durability and value for money. The price might appear steep at first, but once you buy the Disc-O-Bed Cam-O-Bunk Cot, you will not need a replacement for many years to come. Even better is the fact that you are not getting just a single cot, but two for the cost of one. Does it get better than this really? Have you ever gone camping only to realize that you have lost your valuables such as keys and MP3 players? If yes, then you need camping cot that keeps all your stuff organized in one place. That cot is none other than the TETON Sports Cot Organizer. With this one, you can keep all your stuff handy. That is why it is called the organizer. You no longer have to fumble for your wallet, keys, a book, flashlight or any other smaller item. Every smaller item that you might need during the night or day, can comfortable be stored inside one of the eight pockets. Yeah, you heard it right, eight! If you wear glasses, then you can store them inside the fleece-lined pockets. The velvety texture inside these pockets keeps the glasses protected against scratches as well as other impending damage. With this accessory, you will never step on your glasses or lose them again during your camping trips. There is also a drink compartment that comes with a rigid base to keep your drinks stable and secure. The drink compartment also has a drain hole, which allows the spills to flow easily to the ground, instead of wetting the entire cot. A sturdy cord that features a quick-release clip can be used to keep the toilet paper within quick reach. Where else do you get such a thoughtful design? Design and construction goes hand in hand. Looking at the construction, this one is made of 600 D Oxford, strong and sturdy nylon material. Also included is a gun sleeve that keeps your firearm off the floor and hidden. With the TETON Sports Cot Organizer, you can keep your camping space organized, regardless of the size of your tent. If you are looking for a sturdy camping cot that you can sleep on as you enjoy the great outdoors, then you should check out the Tough Outdoors Camping Cot. Just like its name suggests, this camp cot is designed to withstand different elements. Whether you are going for a camping trip, hunting, kayaking, backpacking or hiking, this camping cot will leave you with a memorable experience, as you soak in the fresh outdoor air. You can use it across the 4 camping seasons since it’s built to withstand different weather conditions. It can support a maximum weight of 310 pounds, making it one of the best camping cots for adults. One of the main benefits of this camping cot is its portability. Once you’ve finished camping, you just need to fold it down, fit it inside its storage bag and sling it over your shoulder. Furthermore, it only weighs 8kgs. Therefore, carrying it from one point to the other should not present any challenges. It comes with an organizer, which makes it easy to store your valuables. Whether it’s a toothbrush, car keys, cellphone, bear spray or wallet, the organizer provides a convenient method of storing your valuables, for easy access. Also, setting it up and taking it down is easy and fast. Strong, comfortable and supportive, this camping is designed to give you a memorable camping experience. Most people always associate outdoor camping with sleeping on the floor, where you will encounter all sorts of discomfort including sticks, rocks, uneven ground and crawling insects. However, all that has changed with the introduction of camping cots. With this camping cot, you can enjoy fishing, hunting and other various outdoor activities. Some of its key features include a maximum weight carrying capacity of 300 lbs. This implies that it can accommodate an adult and a kid. Apart from that, it comes with a height of slightly below 7 inches, making it suitable for taller campers. It also comes with a carrying case, making it highly portable. There used to be a time when you had to carry a standard wooden bed to the campsite, assemble it and then disassemble it. The whole procedure would take close to an hour, eating into your camping time. With this camping cot, all that hassle and effort is no longer required. It can be set up within 3 minutes, and you are ready to relax and enjoy the outdoor weather. You might be asking yourself what makes this cot so popular. To start with, it is well built, lightweight and durable. It therefore guarantees to provide you with incredible sleep at night, without falling apart. Additionally, it is one of the most comfortable camping cots. You don’t feel the middle bar pressing against your body. For the price, it is a good product. World Outdoor Products is a reputable brand, when it comes to making quality and reliable outdoor products and accessories. The quality of materials used, combined with the high standards of workmanship result to a product that will provide you with dependable service for years to come. The company designed this military style camping cot to provide with comfort, relaxation, and peace of mind. Therefore, if you are planning a camping trip, and comfort is all what you need, then you can be assured that this camping bed will provide you with that. What makes this one so comfortable? The design itself is unique. Unlike others with cross bars running across the cot, this one has eliminated that inconvenience. The strong canvas material is only supported on the sides. This frees up the sleeping area. Secondly, it comes with a ground clearance of up to 17 inches. This provides you with space underneath to store your bags. You also need to note that you can use this one in all weather conditions. The polyester cover used is mildew-resistant, durable and easy to wash. High grade anodized aluminum is used to make the frames. Apart from providing strength, these frames are also rust proof, which adds to the overall durability of the product. If you are planning a camping trip that involves moving from one camp site to the other, this cot is highly recommended. It is lightweight and portable. It also comes with a carry bag that is durable and convenient, including a strap to sling over your shoulder. Still looking for more reasons to buy it? Does camping get better than this? Camp in comfort, luxury and style without coming along with an inflatable mattress or a separate cot, with the Kamp-Rite Compact Collapsable Tent Cot. It is actually a combination of two unique products in one. First, there is a weatherproof shelter created with heavy-duty 210D nylon as well as an integrated cot that lifts you from the ground. The way you decide to use the products is always a matter of personal choice. You can either use them together or you can separate them, that is the cot and the tent and then use them independently. This means that you will be getting two remarkable products for the price of one. Isn’t that great? It is comfortable, fun and easy. As previously noted, the tent is constructed using heavy-duty, weatherproof 210D nylon together with fly mesh on all doors and windows. The mesh allows ventilation to get in while keeping out the annoying bugs. Additional construction details include taped seams, triangular windows, easy to use zippers and powder coated steel frames. This camping cot with tent can support weight capacity of up to 300 lbs. You will definitely love the easy setup design, which you can do in less than a minute. The package comes with all needed accessories for the setup including a rainfly, ground pegs, two carrying bags, superior quality buckles and clips as well as an under-bed storage bag. When fully assembled, it is a tent and a cot, providing protection from wet ground and the elements. When it comes to hiking and camping, weight is a huge consideration. With this Outad cot, you get the luxury of travelling light as you go for your camping trip. Unlike other camping beds where you need to buy a sleeping pad separately, you will not need one in this case. The cot itself is comfortable and supportive. You just take it out, set it up and you are just moments away from sweet dreams. Looking at the materials and the construction, this one is made of 15D double-sided silicon coated nylon flysheet together with floor fabric. This material is highly durable. The cot’s frames, together with the poles are made from high quality aluminum poles. The 15D nylon flysheet combined with 600D oxford cloth used on the cot bed makes this one extremely lightweight, tear resistant and windproof. It is also waterproof from 15cm to 20 cm. It is advisable to avoid contact with the ground. It has a weight capacity of around 440 lbs meaning that it can support an adult together with a kid. The bed fabric is made of comfortable, durable, tear-proof and waterproof nylon. This one is extremely easy and fast to assemble and disassemble. If you are looking for an ultralight camping cot for your next camping trip, then you should consider this one. The Therm-a-Rest Mesh Cot is a sturdy and lightweight camping cot for hiking, biking trips as well as other activities, where you will be spending the night outdoors. Extremely lightweight and compact, this is a great camping cot for people with back problems. A carry bag is included, as well as instructions of how to set it up. Its top fabric is made of breathable mesh, which is both durable and super comfortable. This camping cot for adults is engineered using the company’s proprietary BowFrame technology, which prevents the joints from squeaking while eliminating painful crossbars from your back. Whether you are sleeping with a mat or not, this cot will always deliver a comfortable sleeping experience. You can sleep comfortably on your back, sideways or whichever side you may turn, and you will always sleep soundly. Furthermore, the mesh fabric used is durable, stretch-free and breathable. The sleeping surface is smooth. Setting up this cot is easy. It will take you approximately 15 to 20 minutes if you are doing it for the first time. Consequent setups will take a shorter time. Also, its extremely compact and lightweight design makes it easy to move it from one place to the other. If you have upcoming camping, hiking or biking trip, the Therm-a-Rest Mesh Cot is a must have. With this cot, you will be sleeping in style and comfort. Furthermore, it’s durable and lightweight. Also, you can use it indoors, if you have a friend crashing for the night. The Coleman Trailhead II is one of the best folding camping cots that you can purchase today. It comes with a strong, powder-coated steel frame combined with a military-style build giving it the stability to support up to 300 lbs. Just like other products from the Coleman brand, this camping bed is all about affordability and simplicity. It is not the lightest, but it will definitely get the job whenever and wherever. The sleeping surface is made of polyester while the 3-scissor action folding legs ensure that it can be set up on different surfaces. With a length of up to 75 inches, this one can comfortable accommodate people who are slightly above 6 inches. It won’t be wrong to label this cot as very sturdy and comfortable. You can continuously use it for several nights and it won’t disappoint as long as you stay within the weight limit. With a polyester fabric bed, it can endure many washes without losing its strength or even fading. It is also fitted with side pockets to keep you organized. Your smaller camping accessories like watches, glasses, flashlights or even phones can be tucked inside these pockets, which are within easy reach. The Coleman Trailhead II provides you with a comfortable and lightweight alternative for all your outdoor sleeping needs. The steel frame is strong and sturdy while the strong fabric adds to the overall durability. The Therm-a-Rest Ultralite Cot is one of the lightest camping cots on the market. However, it can comfortably support a maximum weight of 325 lbs. Therefore, if you are looking for a camping cot for big guys and adults, then this should be a perfect choice. It’s designed to make your night as comfortable as possible as if you are sleeping on your own bed. When you spend a night sleeping on this cot, you will not wake up with an aching back or stiff joints. And with a sleeping space of 24 by 72 inches, it provides a larger area than most of its competitors. Therefore, you can roll and turn as much as you want, and you will not fall off from the edges. Therm-a-Rest has redesigned this cot to help it retain the heat your body sheds. Whether you are kayaking, backpacking, fishing or riding your bike across the countryside, this cot will make your nights as comfortable as possible. Setting up this cot is easy. As much as it might take long when you are doing it for the first time, you will eventually get used to it. Furthermore, the company has a video on their site, which explains the set-up process in detail. After that, it will be easy and effortless. If you have been experiencing sore backs whenever you go camping, this cot will fix that problem. It’s sturdy, cozy and supportive. Many camping enthusiasts are willing to sacrifice a few hours of their sleep, just to stay longer by the campfire and enjoy some marshmallows and Coca Cola. However, most people forget that sleep and rest are very crucial, especially when you are camping. When you get insufficient sleep, you wake up feeling tired and restless. After all, the whole idea of camping is to relax and enjoy some rest. Therefore, if you wake up feeling tired, you will not enjoy your day and your camping trip will not be as fun as you had planned. How do you ensure that you get quality sleep at night when camping? By investing in a quality sleeping system. A quality sleeping system will ensure that you can sleep comfortably, give your body sufficient time to rest, and relax. One of the best ways of achieving this is using a camping cot. What is a Camping Cot Anyway? A campaign cot is a collapsible, relatively lightweight bed, which is ideal for various camping situations. It is composed of wooden or metal frames, overlaid with a strong fabric material, which acts as the sleeping surface. Most camping cots collapse to fit into a carry bag. With such a convenience, you can easily carry it on your back or inside the trunk of your car. Unlike conventional cots that may only fold up once and take up quite a bit of space, camping beds are designed to collapse completely and take up the least possible space. The best camping cots are constructed using nylon, polyester and rust-resistant metal. When insects and spiders scare you away from a hammock and the idea of stones and sticks make lying on the ground using a sleeping bag unbearable, a sleeping cot is the perfect solution. No more insect bites, no more dampness and no more crawling mammals. Why should you consider a camping cot over other camping sleeping arrangements? As noted above, the main advantage of using a camping bed is that it keeps you raised off the ground. When you are camping on rocky terrain, it can boost your overall comfort and ensure that you get good sleep and rest at night. If you are one of those campers with problems getting up and down, using an elevated bed can be all what you need. Camping cots are also great for simply lounging and relaxing around the campsite, as you sip your drink and read a novel. Being elevated off the ground also helps in temperature regulation. Cold air settles naturally. During the night, the cold ground can drain your body heat through conduction. This leaves you feeling cold, which might also interfere with your sleep. A camping cot can mitigate both issues, since it raises you off the ground. Moreover, when you are camping in warmer conditions, a camping bed can keep you cooler, since it allows free air circulation beneath and above you. More to that, some campers prefer sleeping on a cot without necessarily using a camping tent. This provides a greater connection with the outdoors. More importantly, once you are done with your camping, you don’t have to store the cot inside the garage until your next camping trip. You can still use your camping cot as a guest bed, when you have visitors coming over. It’s a win in all situations. Where Can Camping Cots be Used? Camping beds are great options for canoe camping and car camping. They can also be used for supported biking trips, where you don’t have to carry the cot too far. Cots are also great for those looking for a sleeping system, in long-term camping situations like research trips and base camps. These are situations where you can afford to pack extra bulk and weight for extended comfort. In short, camping cots can be used in a wide range of outdoor camping situations, providing you with rest, comfort and relaxation. What Buying Considerations Are There? If you are searching for a camping bed, comfort, portability and weight, stand out as the most important factors. Some of the most comfortable cots are also among the heaviest. It is therefore impossible to carry them for long distances, especially on your back. Very light and portable cots, tend to be very expensive. On the other hand, extra strong or oversized cots are also highly priced. Therefore, you need to strike a balance between the features you are looking for and the budget considerations. One of the main components of a cot is the support structure and the frame. Most frames used on camping cots are made of aluminum. Aluminum is preferred since it is lightweight yet strong, which are two important considerations. Most heavy-duty cots feature steel frames that can endure heavier weight, before failing or bending when subjected to load. Ensure that you check the weight rating of a cot, before buying. Camping beds come with 3 main leg styles. Some cots come with military X legs, others have vertical legs while some contain legs connected through a horizontal bar forming a C-shape. The C-shape design is commonly found on cheaper cots. It is preferably suited to indoor use. If you intend to use a cot inside your backpacking tent, ensure that the legs have rubber end caps. Alternatively, you can choose curved leg design. Cot legs tend to puncture or tear the floor of a tent. Some companies even sell separate coasters, which you can attach to the feet of the cots, specifically for this purpose. Most modern cots are constructed using nylon fabric or single layer polyester, which is easy to clean and supportive. Polyester and nylon is also soft on the body, if you decide to sleep light. Avoid cots that have a cotton canvas fabric. Cotton is much heavier, which means that it will take longer to dry, once exposed to moisture. Apart from that, it retains stains and dirt easily. However, if you simply want a retro look, then you should go for it. Some meshes are made of mesh fabric, which is much cooler and suitable for warm weather camping. Camping beds rely on spring systems or fabric tensions, to provide support to the sleeping surface. You can adjust some tension systems, to attain your optimum level of comfort and support. On the other hand, you can fine-tune some spring systems, with the addition, relocation, or removal of the supports. As previously noted, some cots come with extra padding. Some cots are so plush that they almost resemble recliners. You only need to adjust them according to the instructions. The sleeping surface acts as the sitting surface. The padded models also provide additional comfort. However, they are bulkier and heavier. Conversely, you can use a camping pad or a foam mattress for extra cushioning and warmth. This option is more flexible. Stay away from cheap models that come with poorly positioned crossbars. Such models can be very uncomfortable to sleep in. You will eventually wake up with a painful back and take away all your camping enjoyment. The average, aluminum-framed camping bed, weighs approximately 15 to 20 pounds. If you choose a heavy-duty, oversized, or steel-framed cot, then you should be ready to bear the extra weight. Cots that contain extra padding are also heavier. On the other hand, some cots weigh only 3 pounds and below, and are designed for back packers and extended hiking trips. If you intend to use your cot repeatedly on a specific camping spot, then weight will not be an issue. However, if you are a nomad, then you should consider a cot that has reasonable weight. You also need to find the right balance between weight and support. Some cheaper models claim to be lightweight, only to collapse to the ground when you are sleeping. Travel insurance might not cover such issues. Check for a camping bed that is rated safe and strong enough to support your weight. Make sure that you buy a camping cot that can support more than your weight. You just need to be sure that the chosen cot will not collapse under your weight. The average dimensions of a standard cot is approximately 75 inches long and 25 inches wide when spread. Such a cot is normally large enough to accommodate majority of the adults. However, military-style cots, and other models are much longer, to accommodate taller campers. Shorter models are for children and youth. Some cots can run up to 40 inches wide. These models also tend to be heavy duty, giving them the strength to support burly campers. You also need to ensure that you buy a cot with a ground clearance of at least 23 cm. This way, you will have sufficient room to store your camping gear and still have enough height away from bugs, crawling mammals and moisture. Kid’s cots come with a ground clearance of up to 15 inches. All camping cots are designed with a certain degree of collapsibility. This enhances easy storage and transportation. Some disassemble completely while others are easy to fold over, forming small sections, which you can tuck inside a bag. The packed weight and size determine overall portability. Some of the most portable cots only weigh 2 to 4 pounds, and can pack down to the size of a 2-person tent. Cot manufacturers market such cots as possible options for backpackers. The disadvantage with these minimalist camping beds is that they are too low to the ground when assembled. Most also have a lower weight capacity and may not last long. However, the same case applies to all outdoor gear designed to be lightweight and portable, where there is a tendency of compromising on durability. Most collapsible cots come with a carrying bag fitted with shoulder straps to enhance transportation. Packing the cot is usually the first thing you do when going for a camping trip. The second thing involves assembly when you arrive at your camping destination. Most cots come with a simple design, making it easy and straightforward to set up. All you have to do in such cots is to unfold them at the joints, and they snap into place. Most basic aluminum-framed cots operate this way. On the other hand, there are those cots designed for the seasoned camper. They feature innovative designs, which need some slight assembly. Some might require snapping the shock cord poles together and then threading them through the fabric. After that, you need to assemble the tension springs followed by inserting them into the cot’s body. As much as the process looks tedious in the innovative designs, most come with instructional manuals making the whole thing effortless. If you know how to set up a tent, then you can assemble a cot. Assembling a cot should not take more than 15 minutes, even for someone who is completely new to camping. What is the Best Camping Cot For You? Similar to most things in life, it is hard to isolate one cot and say that it is the best for everyone. There is no single best choice. It all depends on your choices and preferences. For example, if you are just into normal camping, who enjoys the extras and values comfort and luxury in the woods, then you should consider the cots with extra padding, which are also sturdier and heavier. You will obviously enjoy the extra sleeping comfort. You can also turn your cot into a lounge chair. Conversely, if you are into lightweight backpacking, then you need to consider a lightweight model, weighing less than 3 pounds. Such models are packable and easy to travel with. The thing is, there is a perfect camping cot for everyone. Happy camping! 2.1 What is a Camping Cot Anyway? 2.3 Where Can Camping Cots be Used? 2.4 What Buying Considerations Are There? 2.5 What is the Best Camping Cot For You?